Located in northwestern Fairfax County adjacent to the Loudoun County line, the Town of Herndon was once in the heart of one of Virginia’s most important dairy farming regions. The third largest town in the Commonwealth of Virginia, Herndon is home to 23,000 residents. 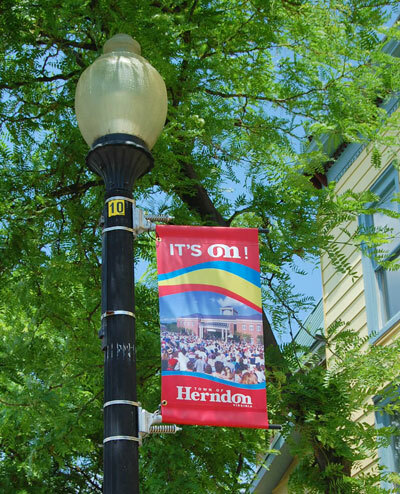 Amidst a 21st century Northern Virginia landscape of high rise buildings, industrial complexes and transportation hubs, Herndon maintains a small town charm that is evident in its downtown, its neighborhoods and its commercial areas. The Town of Herndon benefits from its proximity to a major metropolitan area – 22 miles from downtown Washington, DC. The Town of Herndon has been included in Money Magazine and CNN/Money.com’s 2011 ranking of the “Best Places to Live” in America. Each year, thousands of people enjoy a wide variety of free concerts and special annual events held on the Town Green including the Herndon Festival, Friday Night Live!, Labor Day Festival, and JamBrew. Herndon is also home to the NextStop Theatre Company, a professional regional theatre serving Northern Virginia’s Dulles Corridor that offers theatrical productions for adults and young audiences. Amenities & Landmarks: Enjoy the town’s 11 parks or take a hike on the famous Washington & Old Dominion (W&OD) Trail, which runs through the heart of Historic Downtown Herndon and spans 45 miles from Alexandria to Purcellville. Herndon contains the Herndon Depot Museum, the site of "Mosby’s Raid on Herndon Station", which was a Civil War skirmish that took place on St. Patrick’s Day, 1863. Also within the town is The Herndon Centennial Golf Course, named one of Golf Digest’s “Places to Play”, the Herndon ArtSpace (a community art gallery), and award winning community center with basketball and racquetball courts and multiple baseball fields, and an aquatic center. Adjacent to the community center is Bready Park, with indoor tennis courts. Additionally, every residence within the town borders is within a mile or less of a public park.Nearby attractions include the Steven F. Udvar-Hazy Center of the National Air and Space Museum, Frying Pan Park, Sully Plantation and Reston Town Center. Economy: Herndon is part of the Dulles Technology Corridor, which Fortune magazine named the "Netplex" because of the presence of the headquarters of such companies as AOL, XO Communications, Verizon Business and Network Solutions, which began as the INTERNIC – the registry where every domain name was once administered. According to the Town’s 2012 Comprehensive Annual Financial Report, the top employers in the Town are: Booz Allen Hamilton, SCORE Association, ITT Exelis, Northwest Federal Credit Union, REI Systems, Boeing, Worldgate Sport & Health, Air Line Pilots Association, MTS Transportation and Parsons Brinckerhoff. Education: Herndon is within the Fairfax County Public Schools district. Public schools serving students within the Herndon town limits are: Clearview Elementary School, Dranesville Elementary School, Herndon Elementary School, Hutchison Elementary School, Herndon Middle School and Herndon High School. Getting Around: Located in western Fairfax County, Herndon is just minutes from the Washington Dulles International Airport. Phase II of the New Silver Line will bring Metrorail to Herndon, Dulles Airport and beyond and is expected to complete in 2018. The Herndon station will be constructed in the median of the Dulles Toll Road and will connect to the town on its north side via a pedestrian bridge.The W&OD Regional Trail is a wonderful resource that extends through the town and can serve commuters, shoppers and others wanting to cycle or walk.The Fairfax Connector bus service provides great service connecting commercial and residential areas within Herndon as well connecting to destinations outside of town such as Metrorail and Reston Town Center. History: The town of Herndon, Virginia, was established in 1858 along a railroad line that passed through Northern Virginia. Originally part of the rural surroundings of the Washington, D.C. area, the town of Herndon developed into a hub of dairy farming and vacationing for area residents, aided by its presence along the Alexandria, Loudoun and Hampshire Railroad (later to become the Washington and Old Dominion (W&OD) Railroad). When the railroad was converted into a hike-and-bike trail, Herndon capitalized on history and small-town feel (in a major metropolitan region) by converting its train station into a museum and visitors center by relocating a Norfolk Southern Railway caboose to a nearby site and repainting it in W&OD livery.